The NASA JPL YouTube video Sounds of Saturn: Hear Radio Emissions of the Planet and Its Moon Enceladus (below, also here) provides and audio and spectral representation of plasma waves recored by Cassini as it passed between Saturn and it's moon Enceladus shortly before Cassini's end of mission. 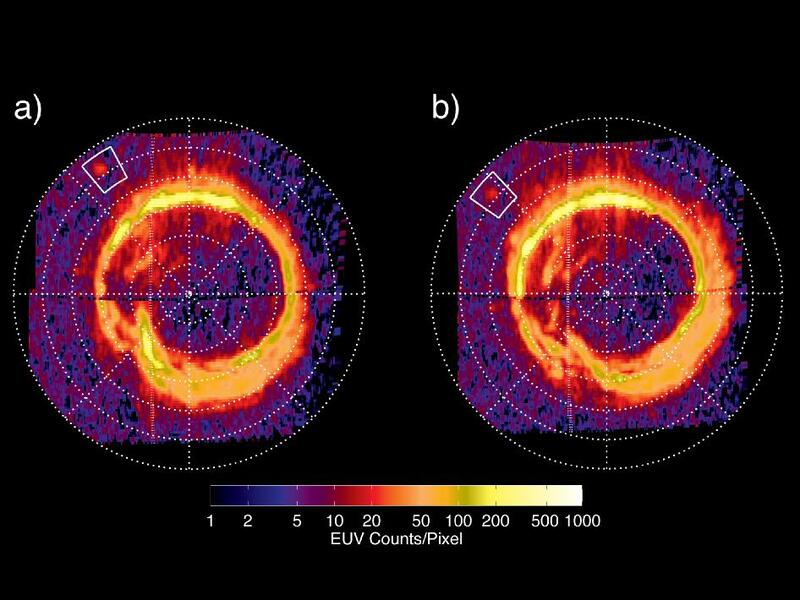 Cassini's Radio and Plasma Wave Science (RPWS) instrument detected intense auroral hiss emissions during one of its perikrone passes of the Grand Finale orbits. The emissions were detected when Cassini traversed a flux tube connected to Enceladus' orbit (L‐shell = 4) and at a time when both the spacecraft and the icy moon were in similar longitudes. Previous observations of auroral hiss related to Enceladus were made only during close flybys and here we present the first observation of such emissions close to Saturn. Further, ray‐tracing analysis shows the source location at a latitude of 63°, in excellent agreement with earlier UVIS observations of Enceladus' auroral footprint by Pryor et al. (2011). The detection has been afforded exclusively by the Grand Finale phase which enabled sampling of Enceladus' high‐latitude flux tube near Saturn. This result provides new insight into the spatial extent of the electrodynamic interaction between Saturn and Enceladus. Question: What is the nature of a "flux tube" between Saturn and Enceladus? Does this refer to magnetic lines flux, or flux of particles, or something else. Also, what does "L‐shell=4" mean? A "flux tube" is a magnetically-confined conduit that allows charged particles to flow between one place in a planet's magnetosphere and another. An "L-shell" is a subset of a planet's magnetic field lines that cross the planet's equator (for most planets, anyway) at the specified number of planetary radii from the planet's center. In a uniform magnetic field, a charged particle traveling along field lines experiences no net force from the field. One traveling perpendicular to the field lines experience the Lorentz force, F = q (V X B), where q is the particle's charge, V is the velocity vector, and B is the field vector. Since that force is always perpendicular to the particle's velocity vector, this leaves the particle running around in circles! If the V vector is askew of the field vector, i.e. it has a component parallel to the magnetic field vector and a component perpendicular to the field vector, its velocity along the field lines remains unchanged, while the component perpendicular to the lines does its circular thing: the particle spirals along the field lines! Net result: charged particles have an easy time of traveling along magnetic field lines, but traveling significant distances perpendicular to the field is nearly impossible. The flux tube is like a conductor surrounded by insulating material. If there is a potential difference between the planet and a moon traveling in the magnetic field, charged particles can easily flow along the flux tube from the moon to the planet, or the other way. That flux tube will follow the usual toroidal geometry of a dynamo field, so for most moons the tube connects to the planet somewhere near the poles. An L-shell is a toroidal surface within a dynamo field. If you imagine all the field lines that pass through the equatorial plane at a specified radius, say at 4 planetary radii from the center, and follow them all to the poles, you get a toroidal surface. Anything within that surface is said to be "at L = 4" or "at an L-shell of 4". L = 2 would intersect the equator at 2 planetary radii, and so on. So a flux tube within the L = 4 L-shell would be said to be "at L = 4". The image below described further here, from Cassini shows (at ultraviolet wavelengths) two things: 1) the "normal" aurora at very high L-shells (thus closer to the pole), arising from charged-particle currents generated at many Saturn radii, where the solar wind and Saturn's magnetic field interact; and 2) the much smaller spot where the Enceladus flux tube, carrying the charged-particle currents, intersects Saturn's atmosphere and makes its own little aurora (in the white boxes). As a Ph.D. student I was in a research group with people that worked with these all the time. Not only could the flux tubes guide charged particles, they can guide radio waves, so these folks would inject powerful radio signals into specific regions and see how the magnetosphere responded. Not the answer you're looking for? Browse other questions tagged magnetic-field saturn cassini plasma or ask your own question. Saturn is “singing” to Enceladus? Does Saturn have a solid surface? What is the solar flux on Titan?